There are plenty of benefits to selling gold for cash. At The Gold and Silver Exchange, we make selling any unused, unwanted, or broken gold easier than ever before. In addition to buying gold that customers bring into us, our experienced gold buyers also buy gold online. Using a safe and secure gold mail-in service, we make selling gold online easy for our out of town and out of state customers! Online Gold Buyers You Can Trust! When working with the gold buyers at The Gold and Silver Exchange, selling your gold online has never been easier! We are always looking to purchase gold and gold jewelry. We are committed to being a hassle-free gold buyer, which is why we offer our gold buying services online. With a safe, simple, secure, and convenient mail-in service anyone can easily mail in gold for cash. We buy all kinds of gold, including gold coins, gold jewelry and rings, gold watches, and so much more! Once we receive your items, we will carefully separate them by Karat, weigh them, and then offer you a price based on Karat and weight. When you choose to sell your unused or unwanted gold to us, you can rest assured that you will get a fair, market-based cash payout. Our established mail-in services are a safe and viable alternative to those risky ‘cash for gold’ websites that will offer you way less than what your gold is actually worth, not to mention impossible return policies. All of our mail-in requests are handled out of our gold buying store in Michigan. When you can’t meet with our gold buyers, selling your gold online with our simple and hassle-free process has numerous benefits! Safe and Secure. Mailing in your gold items may seem like a risky decision, but you can rest assured that our mail-in buying process is safe. We use first priority shipping to ensure that your gold items are safe, secure, and arrive in our hands within a reasonable time. Simple. Selling your gold online by mail-in service has never been easier. In about three quick and simple steps, you will receive a cash offer for your items. All you have to do is request a label, pack your items, and ship them out! Convenient. When you sell your gold online, The Gold and Silver Exchange makes it easy to sell gold without having to leave your house! We will send you a shipping label and even will have your package picked up at your doorstep. Essentially, you can sell gold jewelry online without having to leave the comfort of your own home! Fair and Honest Offers. Unlike those risky ‘ cash for gold’ websites and commercials you see that offer low payouts, we carefully review each item and offer an honest, accurate, and competitive price based on its karat and weight. When you sell your gold to our friendly gold buyers, you get more cash for your items! Unlike your local buyers, we buy pretty much all unused, unwanted, or broken gold jewelry or items. If you have gold jewelry or other gold pieces that you are interested in selling, our mail-in gold buying services make it easy to quickly receive cash for gold online. In just three simple steps, you can get paid for your unwanted, unused, or broken gold items. Fill out the contact form below, or contact our friendly online gold buyers to request a free FedEx shipping label. In a few business days, you should receive your label and mail-in kit. Once the label arrives, securely pack all of the gold items you are interested in selling into a package, ensuring it is closed and sealed properly. Attach the shipping label and then get ready to ship it back to our store. We will have FedEx pick up your package at your doorstep or you can drop it off at your nearby FedEx location. Once The Gold and Silver Exchange receive your items, we will carefully and thoroughly evaluate them by following our gold-buying process. Once complete, our gold buyers will contact you with a reasonable offer. If you choose to deny the offer, your items are returned, no questions asked! If you choose to accept the offer, we will send out a check for the agreed amount that same day! If you have asked yourself ‘where can I sell my gold?’ then you came to the right place. Whether in-store or online, The Gold and Silver Exchange makes getting cash for gold simple and hassle-free. 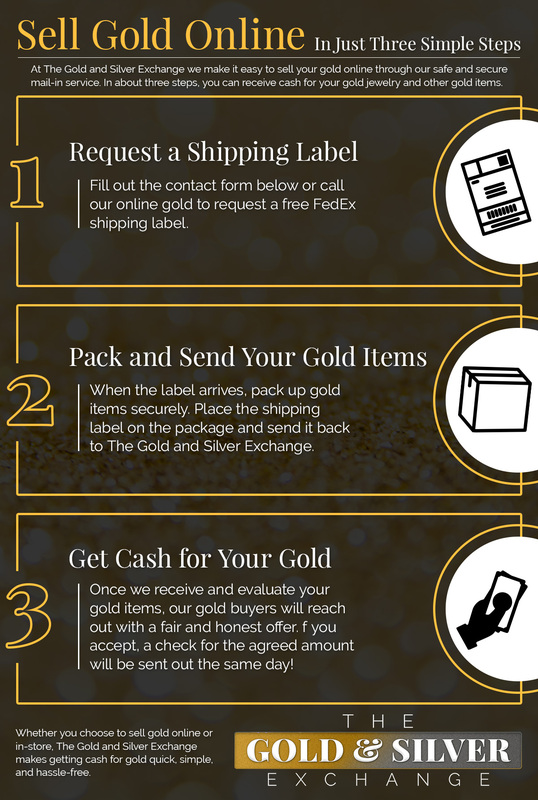 Whether you want to sell broken gold, unwanted gold, or gold that is not needed, contact our helpful gold buyers to receive more information or to request a shipping label to mail in your gold!